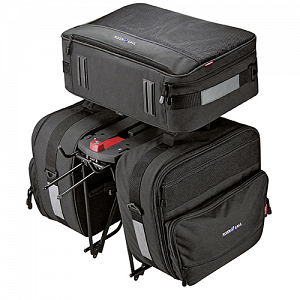 Comfortable traveling pannier set for KLICKfix carrier adapter. All bags can be clicked on within seconds and are centrally secured by the integrated lock. The Set consists of 2 Travelbags GTA, Travel Topcase and carrier adapter. All parts of the set can be used separately or in combination. "Carrier adapter" is a large plate that creates an even platform and at the same time serves as an adapter for "Topcase". Topcase can be locked through a central bar and could be released easily by pressing the red button. Side bags can be hung into the side slits.